West Somerset council; caused by the resignation of UKIP councillor Adrian Behan who had served since 2015. I’ll start this week in the south-west of England by saying farewell. This will almost certainly be the last by-election held to West Somerset district council, which is being abolished in May 2019: it will merge with the neighbouring Taunton Deane district to form a new district council with the appalling name of “Somerset West and Taunton”. Most likely it was West Somerset council which drove this merger: with a population under 35,000 it is the smallest second-tier local government district in England. Until last month there were some electoral wards in Birmingham with that sort of headcount, and 35,000 souls in a rugged area of the country, while being a reasonable economic unit – the Minehead Travel to Work Area has the same boundaries as West Somerset council – is not really enough of a base to support the sort of services which local government is expected to provide these days. 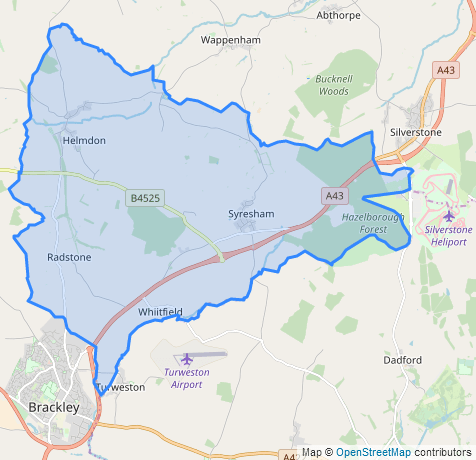 Several tiny district councils in Dorset are going in 2019 as well; as Rutland has unitary status, Melton borough in Leicestershire will take over next year as the smallest shire district by population. Alcombe is the south-eastern of the four wards covering Minehead, West Somerset’s largest population centre, and is effectively a village which has been swallowed up by the town. The name Minehead is cognate with the Welsh word for mountain, mynydd, nicely describing its location at the foot of Exmoor; indeed parts of Alcombe ward lie within the Exmoor National Park. With Minehead being dependent on tourism for its economy – Butlins is still a major employer – jobs here are not well-paid, and Alcombe ward’s census return has high scores in the working-class occupation groups. Not that you’d guess that from Alcombe’s election results, which are fragmented. The ward elects two West Somerset councillors, but since it was created in 2011 no political party has stood more than one candidate here. In 2011 the poll was topped by Ian Melhuish, outgoing independent councillor for the predecessor ward of Alcombe East, with the Tories winning the other seat. Melhuish lost his seat to UKIP in 2015: shares of the vote were 26% for the Conservatives, 22% for UKIP, 19% for Labour, 18% for Melhuish and 14% for the Green Party. At county council level this is part of the Dunster division which is safely Conservative; and next year it will form part of the Dunster ward to elect three Somerset West and Taunton district councillors. With no defending UKIP candidate we have a free-for-all! The Conservatives have selected Minehead town councillor Andy Parbrook, who is hoping to join on the district council his wife Jean. Another Andrew on the ballot paper is Labour’s Andrew Mountford, who runs a B&B in the town. Stephanie Stephens is standing as an independent candidate, and with the Greens not returning Nicole Hawkins of the Liberal Democrats completes the ballot paper. Basingstoke and Deane council, Hampshire; caused by the disqualification of Conservative councillor Anne Court, who failed to attend any meetings in six months. We’ve been here before, haven’t we? Yes, this is the second Kempshott by-election in four months as we make a return visit to the western edge of Basingstoke. This is an area which was developed for housing in the 1970s and early 1980s as the town of Basingstoke greatly expanded thanks to London overspill. Previously this area had been part of Kempshott Park, an estate held from 1789 by the future George IV who spent his honeymoon with Caroline of Brunswick here. A bit of a stepdown from Alberta or Ireland or Namibia or wherever it was that the Sussexes recently honeymooned, but fashions were different in the eighteenth century. George and Caroline’s Kempshott House is no more – it was demolished to make way for the M3 motorway – but the modern Kempshott houses are very much here and very much owner-occupied. 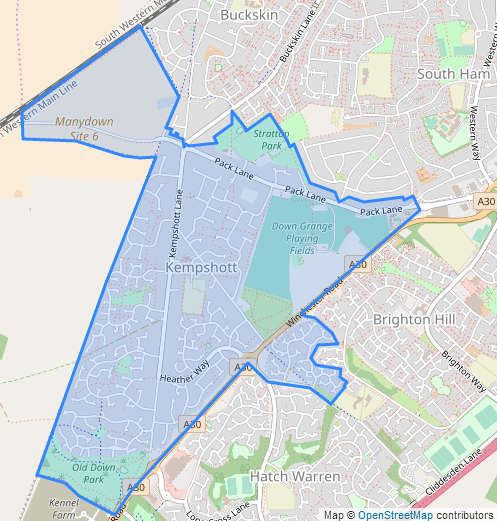 91% of the ward’s households have that tenure, putting Kempshott in the top 100 wards in England and Wales. This is a safe Tory ward where the party is not seriously challenged. It’s the third time in four months that Kempshott voters have been called to the polls, so there may be an element of voter fatigue; however, the March poll, despite being on the first day of spring, was on a day of heavy snow which clearly affected turnout. With today being the summer solstice, snow is unlikely to be a factor this time – although stranger things have happened in the British summer. The Tory lead here was 59-31 over Labour in the March by-election, rising to 67-21 in the May ordinary election. The ballot paper has an unusual feature: the defending Conservative candidate is Anne Court, standing for re-election in the by-election caused by her own disqualification. She had been a Basingstoke councillor since 1995, and was Mayor of Basingstoke and Deane in 2015-16. Late last year Court had a routine knee operation which led to severe post-operative complications: a second operation and a prolonged recovery period saved her leg from being amputated, but it was a close-run thing and that prolonged recovery period meant that she fell foul of the six-month non-attendance rule. This column has seen a few examples of councillors standing for re-election in similar circumstances, and they do usually get back in; with the big Tory lead here and Court’s long previous service for the ward this is likely to be another such case. Hoping that won’t happen is Labour candidate Grant Donohoe, a teacher who stood in March’s by-election and is hoping to go from second to first this time round. Completing the Kempshott ballot paper, as she did in March’s by-election and May’s ordinary election, is the Lib Dems’ Stavroulla O’Doherty. Cherwell council, Oxfordshire; postponed from 3rd May following the death of outgoing Conservative councillor Jolanta Lis, who was standing for re-election. The Mayor of Bicester in 2016-17, Lis was elected to Cherwell council in 2016 and at the time of her death was vice-chairman of the coucil. From one fast-growing town we move to another. Bicester has an old history, being established by the West Saxons in the sixth century close to a junction of Roman roads; but its population has exploded since the Second World War. The town has benefited from improved road and rail links to Oxford and London, while its economy has diversified: as well as the local services and a military presence, the designer outlet shopping centre of Bicester Village opened in 1995 and has become mysteriously popular with tourists from the Far East. There are plans for further major expansion of the town, with 14,000 new homes in a garden city-type development; if these come to fruition Bicester could overtake Banbury to become the largest town in Cherwell district. That population growth led to new ward boundaries for Cherwell council which came in in 2016, so it is difficult to compare with the 2011 census. 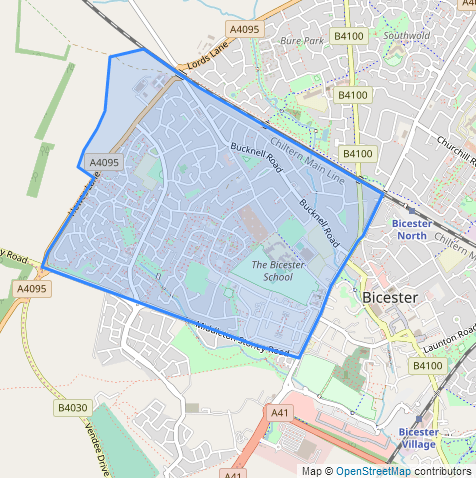 However, the Bicester West ward of 2011 was the town’s most working-class ward; and given that the 2016 boundary changes moved into the ward the town’s most deprived census district, that’s likely to be even more true now. The old Bicester West was close between the Tories and Labour in 2002, and the Conservatives lost a seat there in 2003 to Labour candidate Les Sibley. Sibley has clearly developed a huge personal vote: he was re-elected in 2007, 2011 and 2015 (by which election he had left Labour and gone independent). In 2016, the only previous result on the present boundaries, Sibley was re-elected at the top of the poll with an enormous 48%, almost 1,000 votes ahead of his nearest rival; the Conservative slate was second with 20% and won the ward’s other two seats, with Labour polling 14%. Jolanta Lis was elected in third place and hence was due for re-election in May. Les Sibley is also the county councillor for most of the ward; a small part of this ward is included in the Tory-held county division of Bicester North. This poll will complete the 2018 Cherwell council election. Defending for the Conservatives is their replacement candidate David Lydiat, an RSPB volunteer who is described by the party as a local community campaigner. Lydiat’s main competition may well come from independent candidate John Broad, who has nominated by Les Sibley; Broad was the Labour candidate for the previous Bicester West ward in 2006 and 2010. The official Labour candidate is Stuart Moss, whose Twitter biography simply says “left handed”. Make of that what you will. Completing the ballot paper are Mark Chivers for the Liberal Democrats and a candidate who wasn’t on the original list for May’s cancelled poll, Robert Nixon of the Green Party. South Northamptonshire council; caused respectively by the resignation of Simon Marinker, who is moving away from the area; and the disqualification of Lizzy Bowen, who failed to attend any council meetings in six months. Both were Conservative councillors who had served since 2015. From Oxfordshire we move over the regional boundary into the East Midlands, but not very far – more South Midlands than East. Both Astwell and Whittlewood wards lie on the Northamptonshire-Buckinghamshire boundary either side of the village of Silverstone. Astwell is on the west side, covering four parishes between Silverstone and Brackley; Whittlewood is on the east side. Neither ward is named after its largest parish. The name Astwell derives from Astwell Castle, a manor house associated with the Earls Temple and the Marquesses of Buckingham, who were active in eighteenth-century British politics. Whittlewood, on the other hand, takes its name from the mediaeval hunting area of Whittlewood Forest, much of which still exists today; the ward’s main centre of population is Potterspury, a village on the A5 Watling Street. 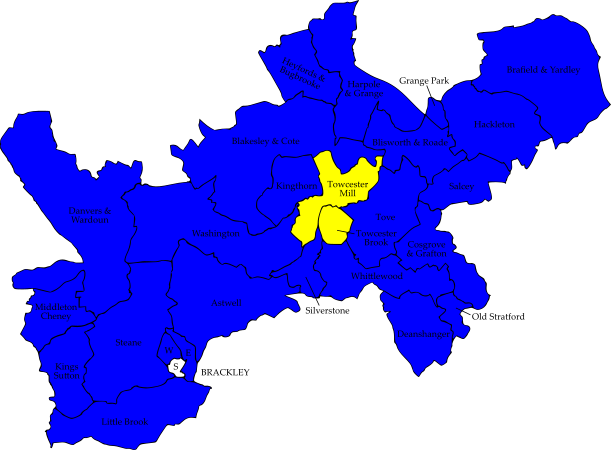 The boundaries of Astwell ward are unchanged since the formation of South Northamptonshire district in 1973. In the twelve ordinary elections since then the Conservatives have only lost the ward once, to the Liberal Democrats in 1995; and Astwell ward has frequently been left uncontested. The most recent election in 2015 was contested, the Tories beating Labour 78-22. 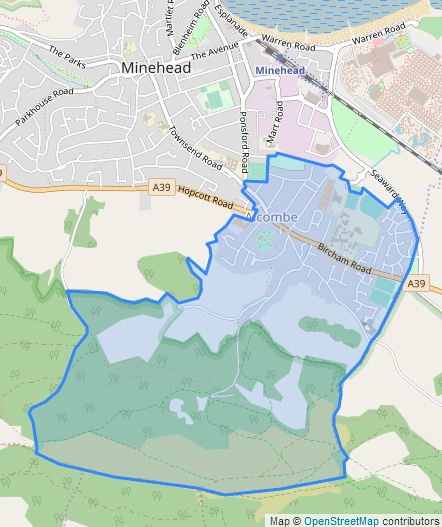 Whittlewood ward was formed in 1999 and has unchanged boundaries since then. 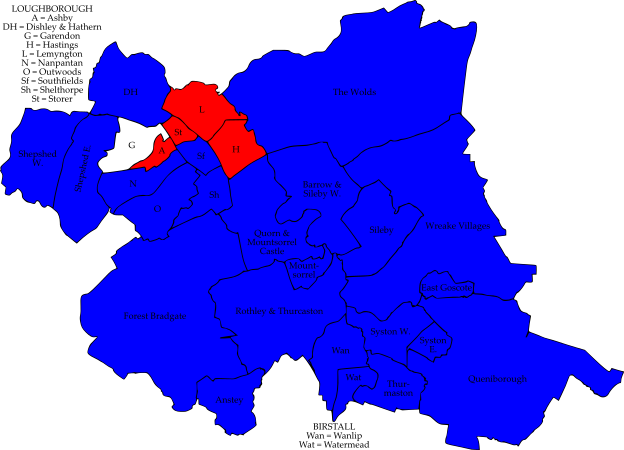 It was held by Labour at its formation, but Labour lost the ward to the Tories in 2007 by the score of 73-27. Nobody has bothered to challenge the Conservatives here since. At county level both wards are in safe Conservative divisions: Astwell is covered by the county councillor for Silverstone, while Whittlewood is part of Deanshanger division. Defending Astwell from the blue corner is Paul Wiltshire, a Brackley town councillor. He is opposed from the red corner by Labour candidate Richard Solesbury-Timms, a train driver who came third in his home Middleton Cheney ward at a by-election two months ago. Neither candidate lives in the ward. Another candidate associated with the rail industry is William Barter, defending Tory candidate for Whittlewood ward; Barter worked for British Rail for seventeen years and is now an independent rail planning consultant. He is opposed by Potterspury resident Abigail Medina of the Lib Dems and by Labour’s Adrian Scandrett. Charnwood council, Leicestershire; caused by the death of Conservative councillor David Slater at the age of 70. A former senior manager for an industrial electronics firm, Slater was elected to Charnwood council in a 2001 by-election and was Leader of the Council from 2010 to 2017. For our East Midlands by-election proper we travel to Leicestershire. The large village of Quorn, or Quorndon as it was known until the Post Office changed the name in 1889 (to avoid confusion with Quarndon in Derbyshire) can be found a few miles to the south-east of Loughborough, with Mountsorrel a little further on. This is an area with an interesting history and mix of industries. Quorn and Mountsorrel are built on granite, and quarrying is the traditional industry here. Mountsorrel is a Norman-French place name, and Hugh Lupus is recorded as building a castle here in 1080; that castle saw action during the Anarchy, but was destroyed in 1217 by Angevin forces during the First Barons’ War, still raging despite the death of King John the previous year. In more recent times Quorn was known as a foxhunting centre: Hugo Meynell, the Father of Modern Foxhunting, bought Quorn Hall in 1753 and took over its hunt. Despite the abolition of foxhunting the Quorn Hunt is still going strong today, and has given its name to three Royal Navy ships and indeed the village itself. The presence of the hunt means there is still a large amount of open and green space in Quorn, and that – together with easy access to Loughborough and Leicester – led a property group in 2016 to name Quorn in its top five places in the UK to raise a family. The ward’s census return certainly has a commuter profile to match. Quorn also has a Tory-voting profile. 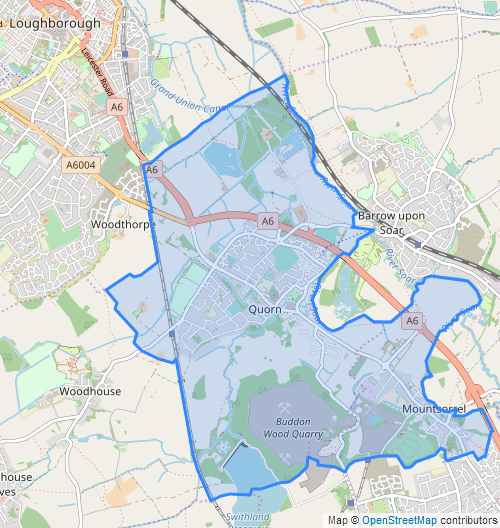 Slater and his ward colleague Richard Shepherd had represented Quorn and Mountsorrel Castle ward since its creation in 2003 and had large majorities. In 2015 they beat the Labour slate 59-27. Most of the ward is within the Quorn and Barrow county division which had a similar result in last year’s county elections. The late Councillor Slater also sat on Leicestershire county council, but for a different area which will poll next week. Those who follow Charnwood by-elections closely will notice some familiar names on the candidate list. The Tories have indulged in some nominative determinism by selecting in this hunting ward Jane Hunt. Hunt was Tory candidate for Leicester East in the 2010 general election, failing to unseat Keith Vaz. (Apologies to any readers who may have been playing the Keith Vaz game.) At the time Hunt was a Charnwood councillor for Loughborough Nanpantan ward; she stood down in 2015 but tried to get back on the council last year by standing in the Loughborough Hastings by-election. That is a safe Labour area; this should be a safer berth for Hunt. Standing for Labour is Chris Hughes, who should not be confused with the Love Island star or Egghead of the same name. Completing the ballot paper are Andy McWilliam of UKIP, who returns from the 2015 election, and Marianne Gilbert of the Lib Dems. All four candidates give addresses in Quorn. Fenland council, Cambridgeshire; caused by the resignation of Conservative councillor David Green. Possibly better known as Dave Boy Green or the Fen Tiger, Green is a former professional boxer who retired from the ring in 1982 with a record of 37 wins (29 by knockout) and 4 losses. TWo of those losses were fights for the world welterweight title: the first against Carlos Palomino, the second against Sugar Ray Leonard. Green went on to become a successful businessman in his home town of Chatteris, and in 2012 was appointed MBE for charitable services, particularly to boxing in Cambridgeshire. He was elected to Fenland council in 2015, and is standing down on health grounds. 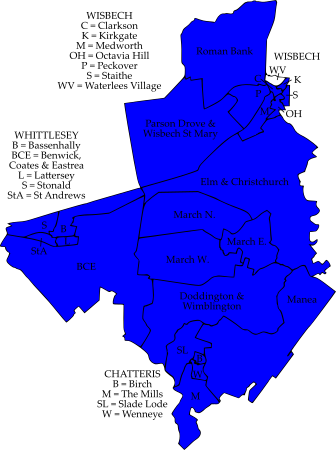 Green represented Birch ward, which covers the eastern quarter of the town of Chatteris. We are deep in the Fens here, and Chatteris lies on one of the few islands of dry ground for miles in any direction. 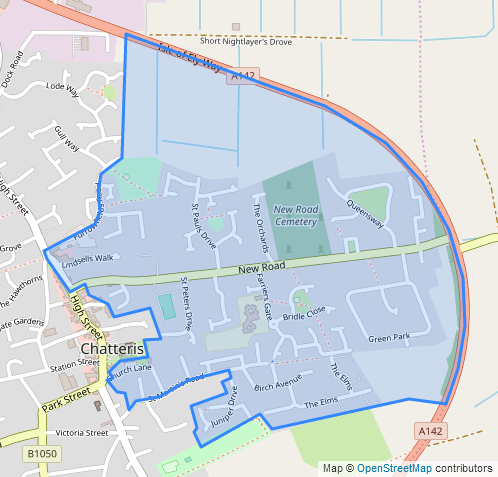 Most of the land surrounding the town is below sea level, but nevertheless has been drained and turned into rich farming ground; agriculture and related services form the bedrock of Chatteris’ economy. There is also a weekly market here. Fenland is a very Tory area and Birch ward is no exception to that. In 2015, the first contest on the ward’s current boundaries, the Conservatives beat UKIP here 56-29. The wider Chatteris county division is also safe Tory. Defending for the Conservatives is Ian Benney, a shopkeeper and Chatteris town councillor. With UKIP not standing, he is opposed by Helena Minton for the Lib Dems and independent candidate Steve Nicholson. Basildon council, Essex; caused respectively by the resignations of Labour councillor Alan Bennett and UKIP councillor José Carrion. Bennett was first elected in 2010, lost his seat in 2014 and regained it in 2015; he is resigning due to poor health. Carrion had served since 2016. You wait years and years to write about a by-election to Basildon council, and then like buses two come along at once. According to Keith Edkins’ list of council by-elections these are only the third and fourth by-elections in Basildon district since the current ward boundaries were introduced in 2002, and the last by-election here was in 2010. Part of this will be an effect of Basildon’s thirds electoral system, which gives an opportunity in most years for vacancies to be combined with the ordinary May election. Basildon was one of the first New Towns, and Lee Chapel North ward is one of the New Town-type developments: it covers the area between Laindon in the west and Basildon town centre in the east, and Laindon railway station lies on the ward boundary. The New Town origins are betrayed by Lee Chapel North’s census return: it is in the top 20 wards in England and Wales for adults with “Level 1” qualifications (in real money, 1-5 GCSE passes or equivalent) and despite a few decades of Right to Buy over 40% of the households are still socially rented. Not socially dissimilar, although generally with 1970s rather than 1950s housing, is Pitsea South East ward at the eastern end of the New Town. 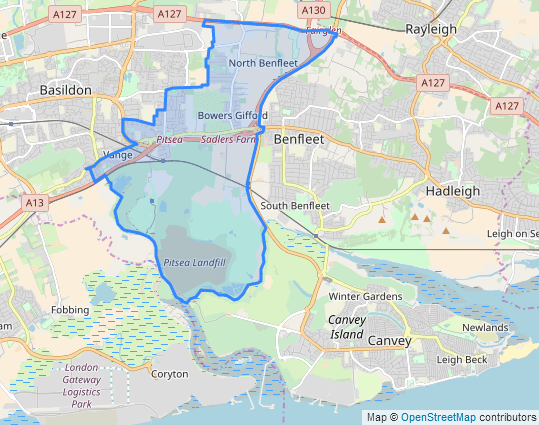 This ward extends beyond the town itself, incorporating the older villages of North Benfleet and Bowers Gifford, the Wat Tyler Country Park and a large area of marshland and landfill opposite Canvey Island. The A13 London-Southend dual carriageway and Pitsea railway station, a junction on the London-Southend line, link the ward to the big city. Wat Tyler of course led the Peasant’s Revolt, and a look at Basildon’s electoral history brings to mind another Angry Mob, who “like who they like and hate who they hate but are also easily swayed”. As a New Town Basildon has been noted for the volatility of its election results: only two years separated the 1992 and 1994 local elections in which the Conservatives first won every ward and then lost every ward. UKIP won eleven seats in the district in 2014, and lost them all last month. Lee Chapel North is generally one of the most Labour-inclined wards in Basildon but the headline winner masks a large radical-right vote: the BNP were third at every election here from 2003 to 2008, and UKIP did well here while they were in their pomp. The Kippers won this ward in the 2014 local election, when two seats were up, and finished 70 votes short of picking up the final Labour seat in 2015. However, Labour recovered the UKIP seats in Lee Chapel North in 2016 and last month, when UKIP were a poor third and Labour beat the Tories 56-27. Pitsea South East also has a UKIP history but is more complicated as it’s traditionally a Tory-Labour marginal. The ward splt its three seats two to Labour and one to the Tories in 2002, but the Conservatives picked up the Labour seats in 2003 (by 54 votes) and 2006, and weren’t much troubled then until 2012 with the rise of UKIP. Labour gained a seat in 2012 by 57 votes; UKIP then came through the middle in 2014 to beat Labour by 95 votes and turn the ward into a three-way marginal. The Conservatives held their last seat in 2015 by a majority of 204 over UKIP; in 2016 UKIP’s José Carrion gained the Labour seat by just 20 votes. Last May’s Pitsea South East election was a double vacancy, with the Tories and UKIP defending one seat each: and it was Conservatives who narrowly emerged victorious, polling 46% to 39% for Labour, and winning both seats with majorities of 157 and 124 votes. So, lots to chew over here. Defending Lee Chapel North for Labour is Kayode Adeniran, a law trainee and Citizens Advice volunteer. Another young candidate on the ballot is 23-year-old Spencer Warner, whose Twitter page – which at the time of writing has a large masthead of Margaret Thatcher – might give a clue that he’s the Conservative candidate. Also on the ballot are Frank Ferguson, the UKIP councillor for this ward who lost his seat in May and wants it back; and Christine Winter for the BNP. Pitsea South East has a shorter ballot paper of three candidates. Defending for UKIP – a phrase this column doesn’t write so much any more for some reason – is Richard Morris who was top of the UKIP slate here in May. Hoping to strengthen the new Tory majority on Basildon council is Yetunde Adeshile; according to her website she is an author, coach, speaker and consultant who works extensively with young people, women and BAME people in Basildon. Completing the ballot paper is May’s runner-up Andrew Ansell, a political consultant. Watford council, Hertfordshire; caused by the election of Liberal Democrat councillor Peter Taylor as Mayor of Watford in the May ordinary elections. He had served as a councillor since 2012. We now come to the edge of London. Oxhey is a suburb, but it’s not entirely clear whether it’s a London suburb or a Watford suburb. 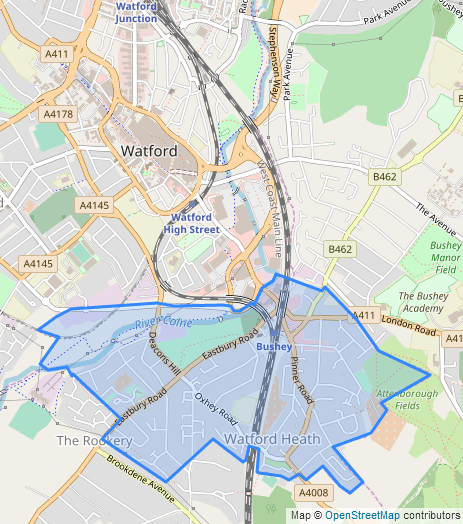 It’s immediately to the south of Watford town centre but divided from it by the River Colne valley, and Oxhey’s original development wasn’t much to do with Watford at all. Oxhey grew in the 1830s, housing workers on the London and Birmingham Railway during its construction, and much of its housing stock still dates from that era. The railway remains the lifeblood of the local economy by enabling commuting, as there are fast and slow trains to London from a mainline station in the centre of the ward. Confusingly, that railway station is not called Oxhey, but Bushey after a town a mile away to the east. That’s not the only confusing thing about Watford, which turned Lib Dem at local level around 2000 in a big way but whose parliamentary seat has been Labour or Conservative throughout that time. 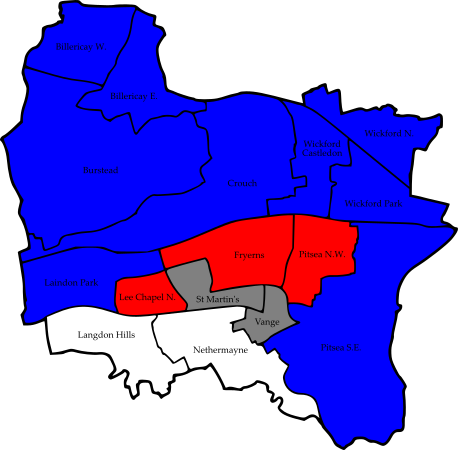 Watford moved to the elected mayoral system in 2002, with Lib Dem Dorothy Thornhill winning easily; Thornhill was re-elected three times before retiring as Mayor in May, and now sits in the Lords. Peter Taylor held the Watford mayoralty for the Lib Dems in May easily, leading 49-34 over Labour on first preferences and increasing his lead to 62-38 in the runoff. At the same time the Lib Dems led even more emphatically in Taylor’s ward, Oxhey, beating the Conservatives 59-23. They also hold the local county council division. Defending for the Liberal Democrats is Imran Hamid, a former building manager who came to Watford from Pakistan, where he had been a police officer in Kashmir. The Watford Conservatives are hoping that electrician Joseph Gornicki will connect with the electorate; he was the runner-up here in May. Also returning from May’s election is Labour’s Sue Sleeman, who completes the ballot paper. Brent council, North London; postponed from 3rd May following the death of outgoing Labour councillor Lesley Jones, who was standing for re-election, at the age of 77. Jones was first elected to Brent council in 1998, and was appointed MBE in June 2015 during her year as Mayor of Brent. We finish in the capital for the final piece of unfinished business from the 2018 local elections. Willesden Green can be found 5 miles to the north-west of Charing Cross, and is one of the many suburbs which grew up along the railway arteries from the centre of London. In this case the railway was the Metropolitan Railway, now the Jubilee Line, whose Willesden Green and Dollis Hill stations lie on the northern boundary of the ward. Willesden Green underground station opened in November 1879, and by 1906 the population of Willesden parish had increased more than sixfold. The Metropolitan Railway took a look at that population growth and increased season ticket revenue and liked what they saw, and they repeated the trick with suburbs further out around Harrow and beyond – the area still sometimes called “Metroland”. Metroland may have been strictly commuter, but Willesden had industry of its own and people came from all over Britain and the world to staff its factories. That pattern is still in place today: in the 2011 census Willesden Green was in the top 10 wards in England and Wales for population born in the Republic of Ireland, in the top 25 for those with non-UK qualifications, in the top 40 for the White Other ethnic group and in the top 70 for mixed-race population. Like the World Cup, there is a veritable galaxy of nations represented here. However, there are suggestions that this picture may now be a little out of date: the ward has seen large population growth and property price rises since the last census, as estate agents and others cash in on the area’s close proximity to middle-class areas like Brondesbury Park. That gentrification hasn’t yet been reflected in the ward’s election results. The current ward boundaries were introduced in 2002 at which point this was a very safe Labour ward whose result contained little of interest. The then Mayor of London Ken Livingstone, who until the previous year had represented most of the ward in Parliament, would have approved. Livingstone’s successor as MP for Brent East was Paul Daisley, who had been a notably effective leader of Brent council. Unfortunately Daisley was in poor health by the time of his election to Parliament, and he died in 2003 from colorectal cancer, aged just 45. 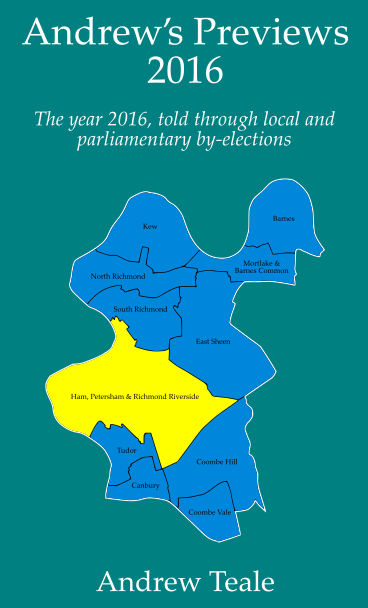 The resulting parliamentary by-election was a famous Liberal Democrat victory, and the yellow machine followed up by becoming the largest party on Brent council in the 2006 election. 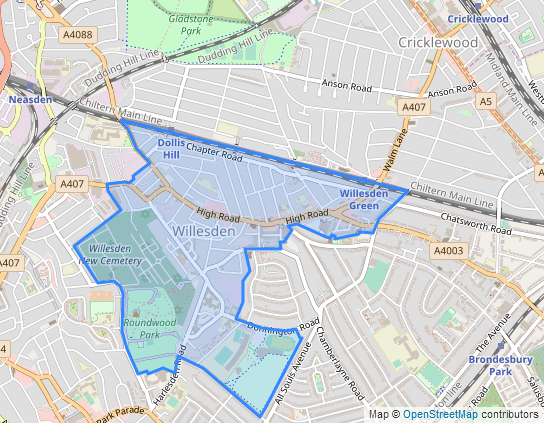 One of the wards which returned Lib Dem councillors was Willesden Green, where the party jumped from fourth to first and won two out of three seats, only Lesley Jones surviving for Labour. The 2-1 split was repeated in 2010, but after that the Lib Dem machine in Brent ran out of steam. In 2014 Labour regained all three seats, polling 43% to 21% for Alex Colas, an independent running under the label “Make Willesden Green”, and just 16% for the Liberal Democrats. The 2016 London Assembly elections show Labour tightening their grip on Willesden Green: Sadiq Khan beat the Tories’ Zac Goldsmith in the ward’s ballot boxes by 57-20, while in the London Members ballot Labour led with 53% to 15% for the Conservatives and 9% for the Greens. This poll will complete the 2018 Brent local elections which currently stand at 57 seats to Labour against 3 for the Conservatives. Hoping to make that a 60-3 split are the defending Labour slate. Elliot Chappell, a parliamentary assistant to the Hampstead and Kilburn MP Tulip Siddiq, has been selected to replace Lesley Jones, and he joins outgoing councillor Tom Miller – seeking re-election for a second term – and new candidate Fleur Donnelly-Jackson, an artist. Alex Colas has not returned for a second go at making Willesden Green. The Lib Dem slate is Felicity Dunn, Ulla Thiessen – a tour guide who came to London in 1971 from her native Schleswig-Holstein – and Christopher Wheatley. Completing the ballot paper are the Green slate of Shaka Lish, Peter Murry and William Relton, and the Conservative slate of Ali al-Jawad (who finished last in this ward in 2014), Shahin Chowdhury and Harry Goodwill. If you liked this selection, there’s a lot more like this in the Andrew’s Previews books. Search for them on Amazon!